However much you might abhor it, it’s hard to deny that armed conflict holds a certain fascination – whether it’s the cutting-edge technology available to the military, the awe of seeing the firepower that this technology allows, the strategy of war or the human dramas and friendships. This interest in the machinations and machines of war can clearly be seen across popular culture: in video games, movies and anime. However, stories based upon all-out war also have some inconvenient disadvantages for those that write them – there’s typically little room for normal every-day life to intrude upon the bloodshed, death and destruction. There’s a handy solution which anime has turned to on several occasions – the existence of so-called “survival games”, or Airsoft. The hobby arrived in Japan in the 1980s, around the same time as paintball boomed in the US and as a generation of blockbuster violent action movies excited the masses. The result was an opportunity to revel in the intricacies of modern weaponry and the thrill of combat, but with no mortal danger beyond the possibility a bruise or two. The starting point for this trend in modern shows is Stella Women’s Academy, High School Division Class C³, a manga series adapted into animated form by GAINAX (who themselves acknowledged Airsoft otaku as part of their early 1990s classic Otaku no Video). Although its setting of a survival game club residing within a prestigious all-girls school gave plenty of excuses for well-realised action scenes, the real thrust of its tale was a very personal one, following a shy girl named Yura Yamato as she is coerced into joining the survival game club before finding that her love of this hobby and the friends she practices with threaten to turn into an obsession. The series sums up much of what makes Airsoft a strong foundation, mixing the camaraderie and competitiveness you’d see in other sports anime with a killer instinct and penchant for tense action. On the other hand we have Sabagebu, a comedy series which takes its Airsoft-loving cast to the opposite extreme. For starters, action scenes are played out with blood spilled and death around every corner, with reminders from the series’ narrator that this is merely the result of the delusions of its participants. This is just the tip of a surreal narrative iceberg that throws increasingly crazy ideas around in the name of getting laughs, backed up by a cast who have no compunction about unleashing their replica weapons on one another (or using their so-called “friends” as human shields). Brain’s Base’s Aoharu x Machinegun has more in common with C³ than Sabagebu. The show’s protagonist Hotaru Tachibana has a desire to enact justice so overwhelming that marching into a local host club to face-off with a member of its staff seems like a logical step. Unfortunately, this love of justice is backed up by an impetuous streak. Clearly, Hotaru is going to have to find a way to pay for the damages caused by these rampages, but, unexpectedly, the suggested resolution to this issue is to join the survival game team run by the flirtatious Masamune Matsuoka. Known as Toy Gun Gun, this is a team with a fearsome reputation, but as Hotaru discovers an overwhelming love for the excitement of the make-believe battlefields of the world of survival games, one of the team’s very important rules threatens to scupper everything at any moment. Toy Gun Gun is explicitly “no women allowed”, but although she might not look it at first glance the tomboyish Hotaru is a girl. 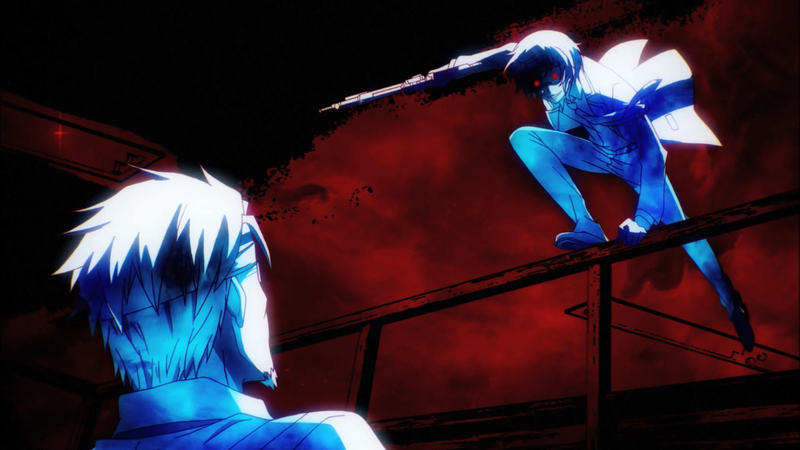 This setup allows Aoharu x Machinegun to operate on two levels. We have Hotaru’s dilemma surrounding her secret – would Matsuoka accept her as part of the team if he knew she was actually a girl? Besides, why are girls even banned from the team in the first place? There’s both comedy and character-driven drama born from this particular issue, mixed in with a few early hints of romance. Meanwhile, we have the actual survival games themselves, offering up some slick moves and nice flashes of action while also allowing for stylistic interpretations of Hotaru and company’s “killer instinct” during matches and training sessions. We have characters talking earnestly of “killing” and the malice which can easily bubble over during a match, but with enough of an air of pure escapism that comedy or more everyday fare is never far from sight. 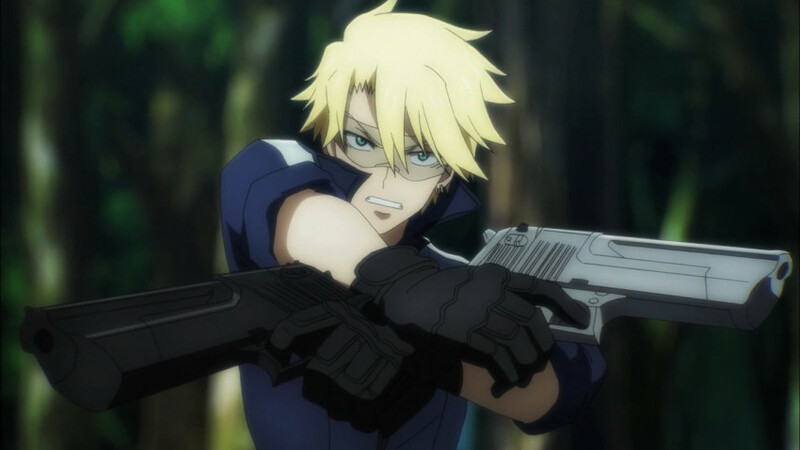 To call it “Ouran High School Host Club with guns” would be going too far, but fans of that classic series will certainly find comparable things to like about Aoharu x Machinegun, and the show makes smart use of its scenario and subject matter. Aoharu x Machinegun will be released in the UK by Anime Limited. It’d be great if someone from Anime Limited remembered that Eureka Seven Hi Evolution is supposed to be released in two weeks and offered it for sale on the webstore. P-P-Please make a limited edition! Please make a limited edition! This series is one of the best Shonen’s out there! An underdog that deserves great and gold pedestal treatment. Pleases make a limited release! All the anime please make a special edition!